MANCHESTER, N.H. - The New Hampshire Fisher Cats, Double-A affiliate of the Toronto Blue Jays, and the Fisher Cats Foundation have confirmed the initial group of guests for the 2018 Granite State Baseball Dinner, presented by Northeast Delta Dental. This year's fundraising event will be held on Saturday, November 17 at 5 p.m. at the Manchester Downtown Hotel Expo Center. Since 2007, the event has donated more than $1.65 million to its three beneficiaries: the Children's Hospital at Dartmouth-Hitchcock (CHaD), the Ted Williams Foundation, and the Fisher Cats Foundation. Tickets are available at NHFisherCats.com. Hall of Famer Steve Carlton headlines the guest list, and will make his first appearance at the Granite State Baseball Dinner. Inducted into the Hall of Fame in 1994, Carlton is one of the most decorated pitchers in MLB history. He received 95.82% of the vote on his first Hall of Fame ballot, which is the 14th-highest percentage all-time. In 1982, Carlton became the first pitcher ever to win four Cy Young Awards. He ranks second among lefties with 329 career wins (Warren Spahn - 363) and 4,136 strikeouts (Randy Johnson - 4,875). His 19-strikeout performance in 1969 also ranks second all-time behind Roger Clemens, Kerry Wood, and Max Scherzer. Carlton spent 15 of his 24 big league years with the Philadelphia Phillies, winning a World Series with the St. Louis Cardinals in 1967 and leading the Phillies to their first ever title in 1980. He retired in 1989 with six 20-win seasons, 10 All-Star selections, and five National League strikeout titles. His 27 wins in 1972 have not been surpassed in the 46 seasons since. Carlton will be joined by New Hampshire legend and former Cy Young Award winner Chris Carpenter , Big Red Machine staple George Foster, Orioles legend Scott McGregor , former big leaguer and current Fox Sports Sun broadcaster Orestes Destrade, as well as Red Sox greats Bill Lee, Luis Tiant, Rich Gedman and Bob Stanley. "We're proud to host this event year after year, and I know the 2018 dinner will be another special night," said Fisher Cats President Mike Ramshaw. "We've been fortunate to have some of the game's biggest names join us to help support these worthy causes, and we're so excited to add players like Steve Carlton and George Foster to that list." The dinner will also include a live and silent auction, where attendees can bid on priceless memorabilia including a Ted Williams signed fighter pilot photo, a David Ortiz farewell collage, a Tom Brady 'Greatest of All-Time' collage, and a Vladimir Guerrero Jr. autographed baseball bat. Tickets for this year's event are $80 and can be purchased at NHFisherCats.com and by calling 603-641-2005. Doors to the event will open at 5 p.m. with a silent auction and an autograph session with the honored guests from 5-7 p.m. The dinner and the evening's program will begin at 7 p.m. The primary beneficiary of the dinner is the Children's Hospital at Dartmouth-Hitchcock (CHaD). CHaD, New Hampshire's comprehensive, full-service children's hospital, is committed to providing outstanding compassionate care for children and their families. Offering primary, specialty, and tertiary care to the children of New Hampshire, Vermont, and beyond, their focus includes keeping all kids healthy and safe. The Ted Williams Foundation works to preserve and build on the rich tradition of our national pastime through education and outreach. Proceeds from the Granite State Baseball Dinner are instrumental in the Foundation's mission to provide youth baseball programs and scholarships for deserving student-athletes. The Foundation is also an active partner with the Rays, Red Sox, Twins, Orioles & Phillies Organizations raising funds to provide assistance to their many charitable programs including the Boys & Girls Club, Pediatric Cancer, Animal Shelters and youth Diabetes programs. The New Hampshire Fisher Cats established the Fisher Cats Foundation to be a catalyst for the betterment of communities statewide by supporting youth programs that encourage education and promote healthy living. Through the generous support of players, employees, sponsors, and fans, the Fisher Cats Foundation continuously works to make a positive impact throughout New Hampshire and north-central Massachusetts. As the primary funding source for the team's philanthropy, the Fisher Cats Foundation supports a wide variety of non-profit organizations and coordinates several fundraising programs and events. Since its inception in 2006, the Foundation and the Fisher Cats have provided more than $5 million in monetary and in-kind donations to thousands of non-profit organizations. 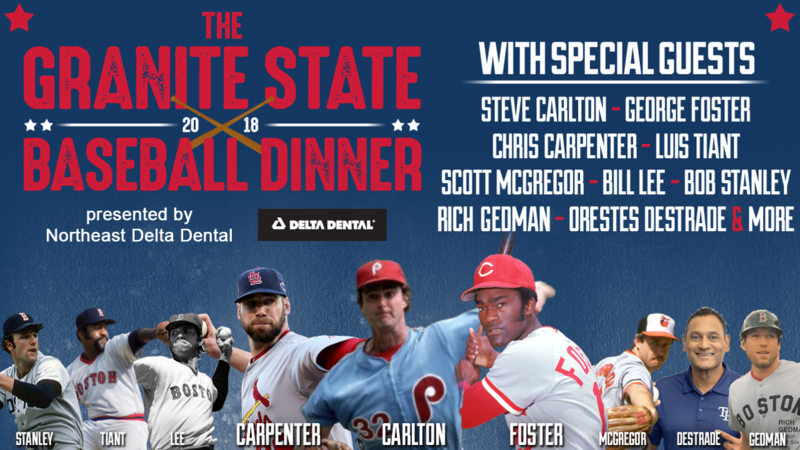 For more information about the charitable Granite State Baseball Dinner, presented by Northeast Delta Dental, please call the Box Office at (603) 641-2005 or visit www.nhfishercats.com.